Live in a basement apartment with no real natural light? Don’t despair; you can grow plenty of Hoyas with no natural light at all. 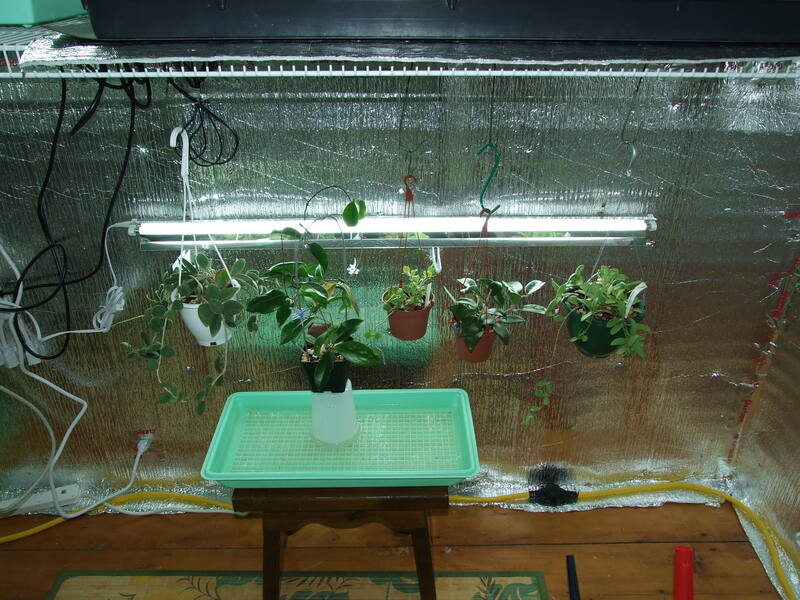 They will grow and flower like crazy under the “right kind” of artificial light. Regular t-12 (1inch) fluorescent tubes in shop lights just do not cut it at all. 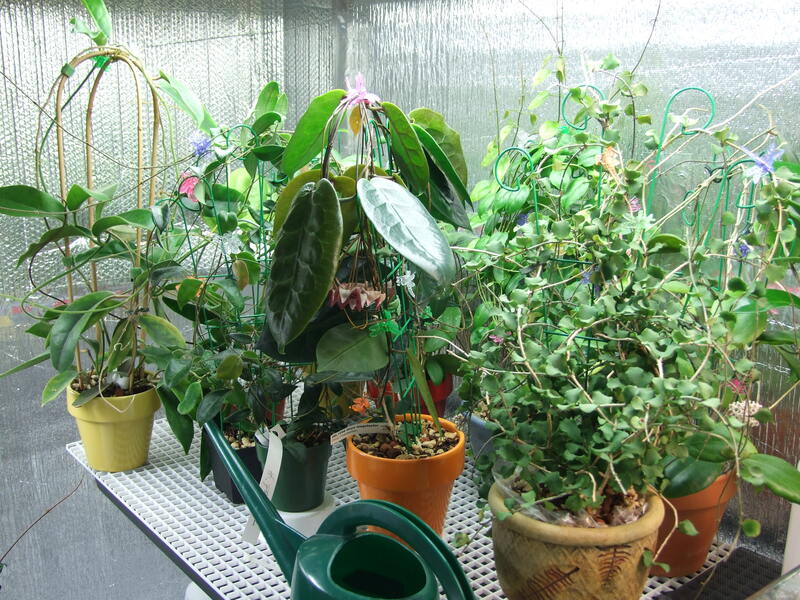 They might be ok to start some cuttings, but they have no penetrating power. I am sure that HID lights would work very well on Hoyas, but I have no experience with them. I know and trust the HO (High Output) t-5 fixtures and bulbs that I use, and recommend them highly. The tubes use 54watts each. 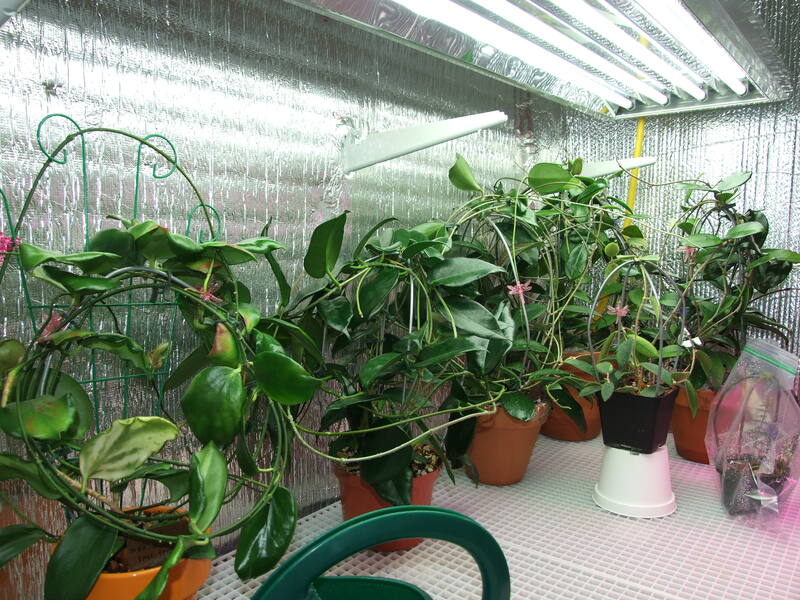 They can be hung overhead or wall mounted to side light your plants. They can be used alone or as supplemental light. I feel that many of the Hoyas that I have bloomed would have been difficult or impossible to bloom without at least some supplemental lighting. These fixtures are more money up front, but they are long lasting. The tubes are no more expensive than regular plant bulbs. I have experimented with LED lighting, but feel that this technology has not yet really “arrived.” Go with the tried and true – Large compact fluorescents, HO t-5 fluorescents, or HID lighting if you can deal with the heat and short bulb life span.